Apple is poised to unveil a mobile phone that plays music just like its best-selling iPod. Made by Motorola the handset will have Apple iTunes onboard and will be available via the US Cingular phone service. The news was broken by analyst Roger Entner who said the information was based on conversations he had had with various industry executives. None of the companies involved were prepared to comment on the revelations. He said that it appeared the phone would be the E790. It was approved by the US telecoms regulator, the Federal Communications Commission (FCC), on 22 August. He said the manual for the phone showed it had iTunes software on it. Speculation that the music phone was about to be unveiled began when Apple issued teasing invites for a press conference on 7 September. Apple famously never talks about unreleased products but it did let slip that the press conference was "music related". Adding to the speculation was the admission by Motorola that the iTunes phone it was preparing with Apple would be ready for release by the end of September. But meat was put on the bones of the announcement by Ovum analyst Entner who gave details of the forthcoming phone to newswires and papers. Mr Entner said the device will give a phone music playing abilities roughly equivalent to Apple's iPod shuffle. This smaller music playing device has either 512MB or 1GB of storage. The larger model can hold up to 240 songs. The handset due to be unveiled will reportedly be the first in a series of iTunes equipped phones made by Motorola that will be given the name "Rokr". What is unclear as yet is whether the phone will allow for music to be downloaded via wireless services or only when the gadget is connected to a computer. Apple and Motorola are not the first to unveil handsets that can play music. Many handsets already have basic media players on board and store many tracks on high-capacity memory cards. 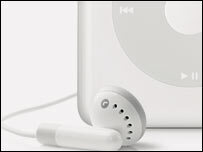 However, the huge success that Apple's iPod in all its guises has enjoyed could help the company to another success. The launch of an iTunes-using phone has been promised and delayed many times before now. The phone was originally due to be shown off at the German Cebit technology fair in March.